Diane Martin was named after her actress Diane Martin. I'll always find that to be very funny. Ryuusuke Oowashi was named after the singer Ryuusuke Kawasaki. 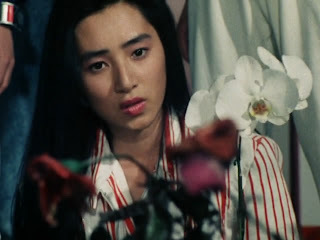 Takayuki Hiba was named after the actor Takayuki Godai. 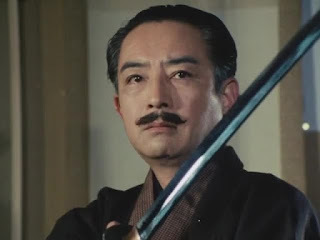 Kinya Shijima was named after the actor Kinya Sugi and Asao Hyou was named after Asao Kobayashi. Megumi Misaki was named after her actress Megumi Mori. Why couldn't they name Hurricane Blue as Nao after Nao Nagasawa? Kasumi Momochi is named after Kasumi Yamaya. Missed any? Let me know! While reading Orends Range, a few days ago the blog revealed that that Zyuohger was getting a crossover with Kamen Rider Gaim. In the past, we have Kamen Rider Decade meeting Shinkenger, ToQGer meeting Kamen Rider Gaim and last year's Kamen Rider Drive meeting the Ninningers. 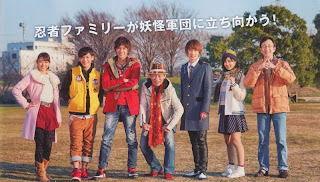 In the case of the Ninningers, they also appeared in the Kamen Rider Drive Grand Prix film though the movie treated the previous crossover independent from the Drive/Ninninger crossover. Do you ever have a favorite Tokusatsu head writer from Toei? If so, there are really times you'll find out that they've badly burned out. Here are some cases of writers burning out. Just because a headwriter does a good job at first doesn't mean they won't reach their limitations. So here's a list of writers you may have liked but also wrote something bad because they just reached their limits that time. Hirohisa Soda is pretty much "hail to the king". 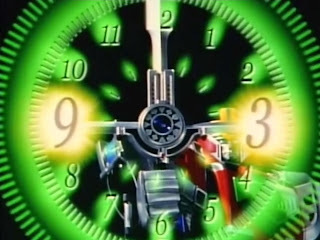 This was probably what many Super Sentai fans considered as "the best era ever" with Hirohisa Soda as the head writer and Takeyuki Suzuki as the head producer for many of his shows. 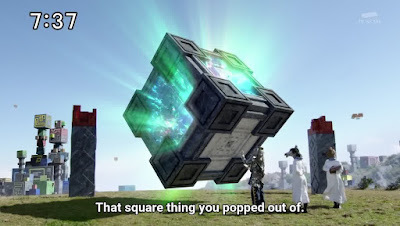 So What's Up With Zyuohgers And The Use Of... CUBES? While watching Zyuohger, I observed the use of cubes. I agree with some Super Sentai fans who call the Zyuohking which I'll dub as the "Minecraft Megazord", some might say, "What's up with the cubes?" But I guess I can speculate for now why Zyuohger came out the way it is. If you take a look at Zyuland at a "bird's eye view" (pun not intended), you can see the whole land is built on cubic architecture. It does look like a child's building blocks but I feel like there's something than more than meets the eye. I feel like the anthropomorphic animal residents of Zyuland are dressed up like tribal people. Now where do we see that kind of concept? After reading some top tens and top twenties and everyone had their varying opinion on who should be on top. I would share these girls in chronological order. Now it's time to check my list of worthy contenders from my own point of view with others in it. Momoko herself can be a worthy contender. I have to admit her beauty is pretty unique. After watching Bioman as a child, I cannot deny while Hikaru Katsuragi was my first Tokusatsu crush but she had turned me on much more. There's the overstatement that Kimberly Ann Hart is every 90s first crush. Not really because there were other girls before her. While Hikaru was my first crush (and she was dubbed as Kimberly in that cheesy dub) but I can't deny her unique beauty got me the most. After watching Zyuranger, I could say well Mei is cute but I cannot deny she's way more attractive IMO. She's still top one for me appearance-wise. Here's my list of top ten Super Sentai villain hotties from top to bottom. This is a real challenge. After seeing this list of hot Power Rangers villains, I decided I could "respond" to it with my own list with Super Sentai villains. While watching Abaranger, I do find Jeanne/Mahoro to be attractive but not that much. If people find Vypra in Power Rangers Lightspeed Rescue hot, well I do find Venus in GoGoFive also attractive. I thought both actresses playing their parts weren't all that good with expressing but they did really still present some impressive fighting prowess. In her human disguise, she's really attractive. Both Venus and Vypra are really never to be underestimated. I was pretty nervous before Zyuohger's premiere. I thought that after Gokaiger, there was really this "fatigue season". I do like Go-Busters but the series wasn't really popular with the rest so it might as well be considered as a fatigue point for Super Sentai. Then came Kyoryuger or what I want to dub as KYOOOOOORRRRYUUUGER which I thought didn't appeal to me. ToQGer was another season which I felt was a real fatigue point due to the writer Yasuko Kobayashi was burning out beyond belief. 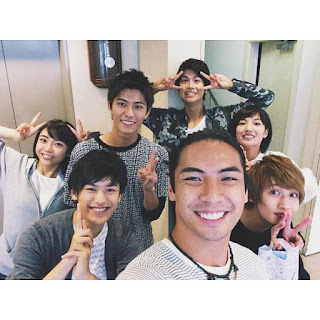 It was Kamen Rider Gaim that filled my Tokusatsu void during the airing of ToQGer, Kyoryuger, Samurai and Megaforce. It's time for Zyuohger and I really can't believe I'm getting a real huge breathe of fresh air from this series. With Junko Komura (main writer of Satria Bima Garuda) doing the job, I wonder how will she fill the void left by other writers? Based on my list of Super Sentai watched from start to end, I cannot really talk too much about all of them. I've seen some of them based on a few episodes or crossovers. Considering today is Valentine's Day, I really thought this entry would be appropriate. There will also be some pink rangers I can talk about too much about as well... taking a deep breath... HERE GOES NOTHING! If you find any mistakes or can tell me what I've missed, feel free to comment. I haven't seen much of Goranger to comment on Peggy Matsumaya as a whole. As far as I'm concerned, it seems everyone in Goranger is really overpowered even out of suit. They've endured 84 grueling episodes of real pain. In a sense, all the Gorangers are really that tough as warriors. She might be called as the mother of pink rangers or for some, the grandmother of pink rangers due to her current age. Here's a list of couples in Toei's list of properties I felt really, really were so out-of-place and not to mention, makes you go WTF. One of my lessons in writing is that pairing without any development DOES. NOT. WORK. Now it's time to take a look at some of Toei's looking for love at the wrong places. Some of these are not necessarily in my bad list, it could have been better, I've learned some lessons from these and I could learn from them to improve my writing. P.S. Spoilers will be involved so read at your own risk. It's no secret I think Super Sentai is already having suffering from what I'd call a franchise fatigue. Ninninger just ended and we're having Ninninger vs. ToQGer coming up, Zyuohger is coming in (with it being the 40th Super Sentai, man do I feel old) and I really have a very mixed impression on the series itself. Kento Shimoyama is still new to being a headwriter so I was wondering what kind of juice he'd pump in. But I guess the bigger problem might be Naomi Takebe (While she was responsible for some of my favorite Kamen Rider shows but I tend to really dislike her as a Super Sentai producer) as the producer or that the action directors involved aren't good at all. I could give another rundown into the series. Plus, aren't there any other themes that they can use already? It can be good to repeat a theme twice but more than twice, it can turn out pretty bad depending on who's in charge. Never Mess With Swordsman Sentai Mentors! 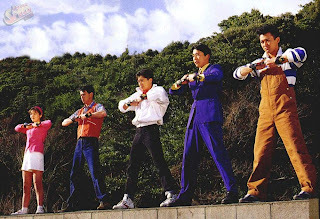 Super Sentai had these swordsmen mentors who really showed some really badass moments. As of right now, here's the following as far as I could remember. After watching Battle Fever J, it wasn't really all that good as it was Super Sentai in its earlier stages but the action was pretty good. The late Chiyonosuke Azuma was a jidaigeki film actor though I only saw him in action in Battle Fever J. He would later appear in battle first to battle the Four Raced Monster which he personally slew it. In the finale arc, he would battle High Priest Hedder one-on-one emerging victorious with his sword. Mugensai Hinata of Hurricanger still counts considering it's a ninja Super Sentai. Can't talk much about him yet though. Happy Chinese New Year! It's time for me to talk about Chinese-based Super Sentai. You might be wondering why Hikari Sentai Maskman isn't here. Maskman used mixed martial arts from both Chinese and Japanese influence. What's so strange about Super Sentai is that while it's a Japanese series, it utilizes more foreign themes. After so many Western themes, they also decided to do Chinese themes. 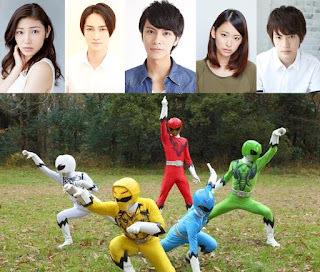 The Possible Exchange Of Ideas Between Super Sentai And Power Rangers? Toei Ltd. hasn't been completely original in its shows. If you notice, even in the early shows you can see how some villains were based on some 70s fictional villains, some are just obviously based on some American idea and you have lot of ideas like Toei's own version of Spiderman, they had Robocop inspired heroes in Janperson and Jiban, the Rescue Police Trilogy may have copied ideas from some other Western shows and many more. I'll share some possible exchanges of ideas from each other. Note I deleted two previous articles and decided to create this one instead. Since Power Rangers is Toei's and Saban's show based on Super Sentai, there's really bound to be some ideas taken from other Super Sentai seasons, not just the parent source. There's some that you can name. My Personal Review On The Power Rangers Franchise: Toei's Big Time Entry Into The American Market! After writing on Super Sentai as the longest consecutive running franchise by Toei, it's time to write on Toei's and Saban's co-production called Power Rangers. 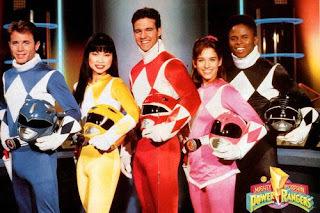 The whole Power Rangers franchise was Toei's big time entry with America when they and Saban both cooperated in creating Power Rangers. Localization of the show happened because of several cultural differences on JEFusion's fanpage. 70s Dance Fever Party Anyone? Considering it's 2016 and Battle Fever J was aired on February 3, 1979 - it's a good thing to see older Super Sentai series getting digitally remastered or I wouldn't watch it. It's a pretty weird show, I don't like the costume designs but it's a pretty fun show at the same time. 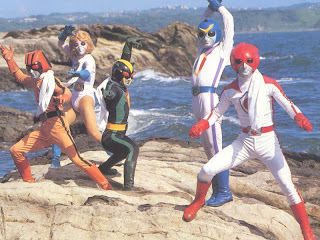 These guys knew how to create a dancing Super Sentai without being overly hyped. I know it's the late 70s but old doesn't always mean bad or good. It all depends on the production team involved that makes a Super Sentai series good or bad. After reading Shogo's entry on The Sword of Time, I thought of writing the same entry with a slightly different title. What I felt like was that there's much to happen with me and I'm not getting any younger. the more I realize that when it comes to Super Sentai or just any Tokusatsu, I end up preferring older Super Sentai even if I may enjoy the newer ones. I want to ask some people on how much old school Super Sentai have they seen anyway before they can say that the latest is the best? Of course, older doesn't always mean better either. Some old school Super Sentai are entertaining and they had better successors then at times, the successors fail to live up to the expectations.